Leo Walters prays over his rustic loaves. It’s such a vital part of his bread-baking process that he lists his blessings on the brown paper bags in which he wraps his Glorious breads. They’re as important – perhaps even more so, he said – than the other ingredients: wild yeast culture, pink sea salt, flour and water. Meantime, “made with love” is printed in all caps on his brown paper bread bags, something he plans to continue long after his retail location opens. While he waits for construction to wrap up, he’s baking bread after hours three nights a week at Madeleine’s Cafe and Patisserie to keep up with his wholesale orders. Walters’ Glorious breads can be found for sale at Huckleberry’s Natural Markets and My Fresh Basket. They’re also served at Madeleine’s, Wandering Table, Perry Street Brewing, Ladder Coffee and Toast, First Avenue Coffee, Cedar Coffee and Elliotts, an Urban Kitchen. Bites and Treats, a local catering company, also features Glorious breads. And it’s in that “forced” slow down – working with his hands, creating beautiful, simple, rustic loaves – where he found his bliss. He honed his skills at “sourdough school” at the San Francisco Baking Institute, which offers workshops in artisan bread and pastry making. And last summer, he decided to pursue his passion, giving two weeks’ notice at his corporate job and going to work for himself. He’s been baking full time since July. That response encouraged him – to expand his skills set, to keep baking bread, to pursue his passion. He’s hoping to get his artisan loaves into the Thursday Market in the South Perry District and Fairwood Farmers Market for the 2019 farmers market season. He’s also hoping to bring his breads back to the farmers markets in Liberty Lake and Spokane’s Emerson-Garfield neighborhood, where he got his start in the bread business last year – and where he regularly sells out of bread. Most of the flour he uses comes from Shepherd’s Grain. He likes it because it’s local. “They get their wheat from farmers all over the Spokane area,” Walters said, noting – also – its growers are “sustainably focused” and practice no-till, direct-seed farming. In addition to prayer and Shepherd’s Grain, Walters swears by a long ferment, letting wild-yeast cultures work their magic – read: chemistry – to convert proteins like gluten into lactic acid to give sourdough its flavor. All of the loaves Walters makes are naturally fermented. He doesn’t use any commercial yeast. He ferments all for two and a half days, then works the dough with a simple slap-and-fold method, stretching the dough, then thwacking it down on the work surface. His signature loaf is a hearty, crusty, versatile bread he calls Rustic Country and sells for $9. The rest of his loaves retail for $10. There’s the popular Fig & Fennel, which “walks the line between sweet and savory very well. You can take it either way.” It features dried figs and fennel seeds. “it’s beautiful bread,” Walters said. His Hearty Toasted Seed loaf features sunflower seeds, flax seeds and pumpkin seeds. There’s a Toasted Walnut & Cranberry loaf, too, as well as a Toasted Walnut & Sour Cherry. The Everything features roasted garlic, minced onion, sesame seeds and poppy seeds. 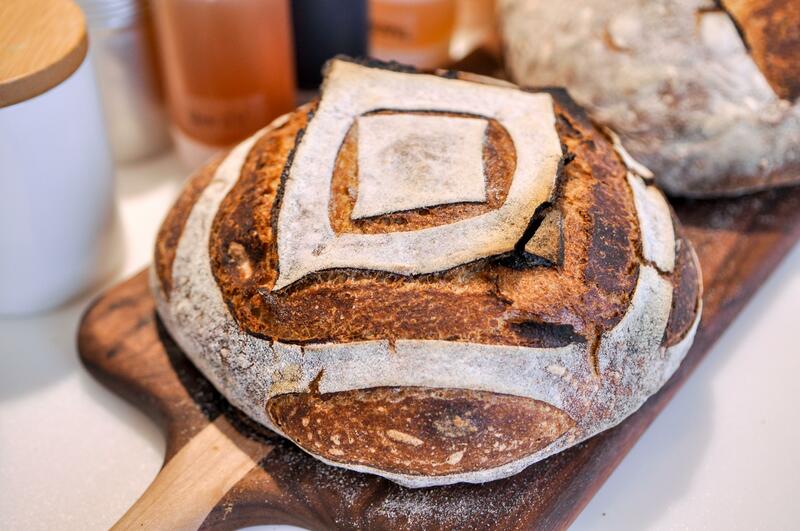 And his Artisan Gluten-Free loaf – the only one that doesn’t use Shepherd’s Grain – features a blend of brown rice, tapioca and sorghum flours, potato starch and xanthan gum. Since he launched Glorious last summer, he said, he’s met “so many cool home bakers along the way.” Once his bake shop is built out, he’s hoping to start a bread group for home bakers, a sort of Saturday Sourdough Club where home bread bakers can gather and share starters and tips, maybe even bake and break bread together. Tentative hours are 11 a.m. to 7 or 8 p.m. Tuesday through Saturday, 11 a.m. to 5 or 6 p.m. Sunday and closed Monday. The idea, Walters said, is to cater to working people who will be able to pick up bread for dinner on their way home from the office rather than starting – and closing – early like many other bread shops. It’s a model, he said, that’s employed by San Francisco’s famed Tartine bake shop. Plans also call for a “softer, warmer color palette” with a “rustic, modern look” and clean and simple lines. He also plans to install a long, large counter where customers can sample breads and oils. Along with his artisan loaves, Walters aims to sell high-end olive and infused oils, desserts, dips, vinegars and maybe also pizzas, calzones and bruschetta. There’s a social aspect to his plan, too. Walters sees bread as a way to build community and build up people. He wants to create a kind of apprenticeship program to help to promote work, life, coping and bread-making skills with people such as veterans suffering from Post-Traumatic Stress Disorder, refugees, asylum seekers and other “vulnerable” populations. Meantime, he’s running a fundraising campaign with a goal of $10,000 to help purchase equipment for his forthcoming, 1,000-square-foot shop. He’s hoping to install a double-stack convection oven and steam-injection oven with two decks in his open commercial kitchen. And, he said, it helps to have a not-so-secret ingredient or two.